I love unique pieces of jewelry and Manomay Jewelry Store has a lovely selection of hand crafted jewelry and accessories. From necklaces, earrings, rings, bracelets, jewelry sets and hair combs/headbands and brooches there is one of a kind vintage inspired jewelry that is absolutely beautiful. These exclusive pieces are designed and created by Ramya, whose passion translates into a collection of unique and one-of-a kind jewelry. Manomay Jewelry Store also specializes in custom jewelry where you can request for existing pieces to be customized to alter the length, change the color of beads, use gold plated chains instead of silver etc. I immediately began to swoon over the Peach Rose Vintage Beaded Bracelet when I viewed it online in the Manomay Jewelry Store and when it arrived it is even more stunning up close. 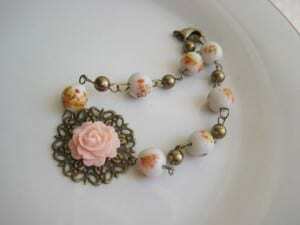 The peach and rose colors are the perfect combination for the summer and the pretty vintage floral beads really pull this piece together to make a statement. It hangs delicately on the wrist and even my husband complimented it….he typically doesn’t even notice my jewelry. I could not believe how affordably priced this bracelet is at only $24.99. It will definitely be one of my favorite jewelry pieces this summer. 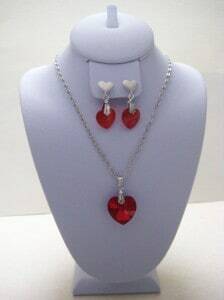 For a romantic evening, the Dreamy Romantic Darling Necklace and Earring Set is also very pretty with a scarlet heart charm on an antique style silver chain necklace and matching mini-heart earrings. Manomay Jewelry Store has a beautiful collection of hand crafted and customized jewelry and it is very easy to shop on the website and browse all the pieces. If you are looking to add a few pieces of jewelry or accessories to your summer collection, are searching for gift ideas or simply want to treat yourself then I highly recommend visiting Ramya at Manomay Jewelry Store. Exclusive discount for Simply Stacie readers! Save 15% off your purchase by using the code SIMPLY15 upon checkout. I like the Song bird in my garden necklace. My favorite item would be the Pumpkin filigree bronze adjustable ring. So pretty! love love love the sparkling champagne pearl necklace! I like the Spring bloom necklace. I like the turquoise stone ring in silver. Super cute! the Vintage inspired black swan necklace is absolutely beautiful & i really would love to get it! These are all gorgeous pieces of jewelry. Wow! These necklaces are gorgeous! I would love to wear these! I love the Spring bloom necklace from the site. I just LOVE the abstract leaf necklace!! I absolutely adore the Tree of Life pendant necklace. Whether I win or not I’m very glad to have found this website. Beautiful jewelry. I do love all their jewelry, but the Tree of Life Pendant/necklace is beautiful! I couldn’t leave a comment in the Rafflecopter because there was no place to respond. Anyway, I really like the pocket watch necklace. I love the Bye Bye Birdie – Gold plated necklace set. I like the Lacy daisies in Ivory bridal necklace. My favorite item is the Happy Purple daisies antique style earrings! I love the Deep Blue Sea statement necklace. Swarovski crystal charm bridal necklace.